The Doran Construction company is an award-winning construction company based in Bloomington, MN. When they were awarded a 257-unit residential development project in Maple Grove, MN called The Reserve at Arbor Lakes, they knew there needed to be an exciting focal point. 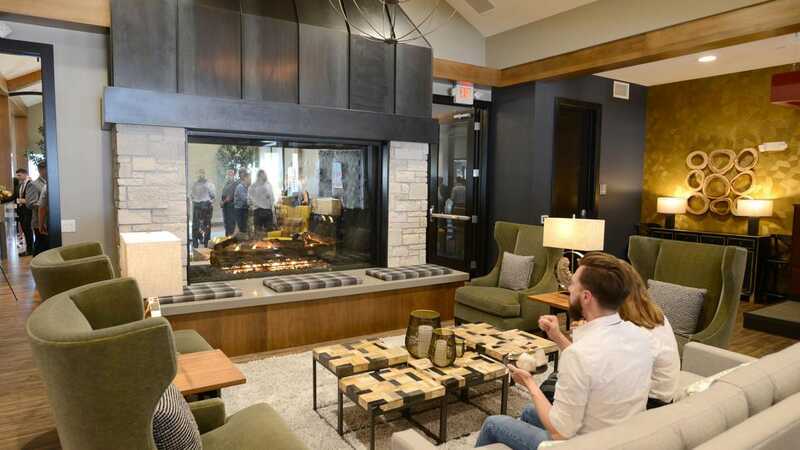 Doran and award-winning Architects & Interior Designers at BDH + Young came to Acucraft seeking a large (88″W x 59″H), breathtaking, custom fireplace design to spice up the 25,000-square-foot clubhouse that connects all the apartments! Doran presented Acucraft with their inspiration photos and architectural conception drawings for the clubhouse fireplace. They were looking to make the clubhouse as inviting and comfortable as possible. With hints of natural materials and layers of unique materials and design, the clubhouse would be a gathering place for all tenants and guests of the Reserve. After working directly with an Acucraft Fireplace Advisor, together Doran and Acucraft were able to create a fireplace design that would deliver the look and feel Doran desired with the quality and engineering Acucraft requires. The fireplace is designed and built to last a lifetime with thick steel and 100% commercial-grade components. The see-through fireplace links the lounge area with a dining space by an 88” wide by 59” tall viewing area, creating togetherness. A golden oak designer log set by Acucraft yields a natural look for the fireplace. Glass cooling completed the fireplace, making it safe to touch for all tenants; perfect for areas where small children or pets may congregate. The project would have never come to fruition if it wasn’t for the hard work of all parties involved including: Doran, BDH + Young, and Fireside. Fireside worked with all parties involved, including Acucraft, to professionally set up and install the fireplace system. Thank you, Fireside, Doran Construction, and BDH + Young for making this project come to fruition! With the project completed, residents and guests have begun to enjoy the fireplace and all the other amenities the Reserve at Arbor Lakes has to offer. By working with Acucraft, Doran and BDH + Young were able to create the perfect fireplace with all the elements they desired for the clubhouse space. View more photos and learn more about the Reserve at Arbor Lakes in the article by Bizjournals! Looking for a custom fireplace design for your new project? Request Your Custom Gas Fireplace Brochure Today!